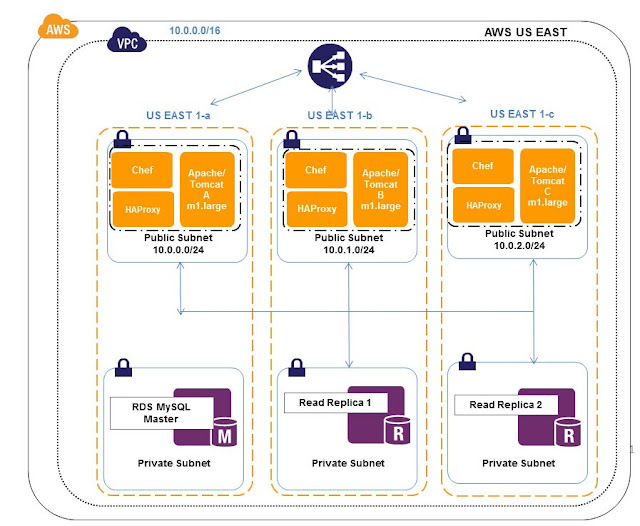 When you are architecting a read intensive online application in AWS cloud you can employ techniques like CDN, Caching etc to improve the overall concurrency and performance of the application. One of the age old techniques applied is also scaling out the Database Read Slaves. To solve this need, Amazon RDS MySQL has a concept of Master and Read Replica Slaves. Depending upon the read intensity and concurrency needed, you can scale out and add more read replica slaves to the Master RDS MySQL. Ideally 1 to 5 Read replica slaves can be placed with RDS MySQL master for performance. If more than 5 Read Replica Slaves are required, it surely sounds like a bad design because of the load it puts on the master, replication lag and overall manageability of this tier itself. I would suggest you need to functionally partition your database or use some other high performance/scale out data stores like caching, MongoDB, DynamoDB, Redis etc in your architecture to over come this. 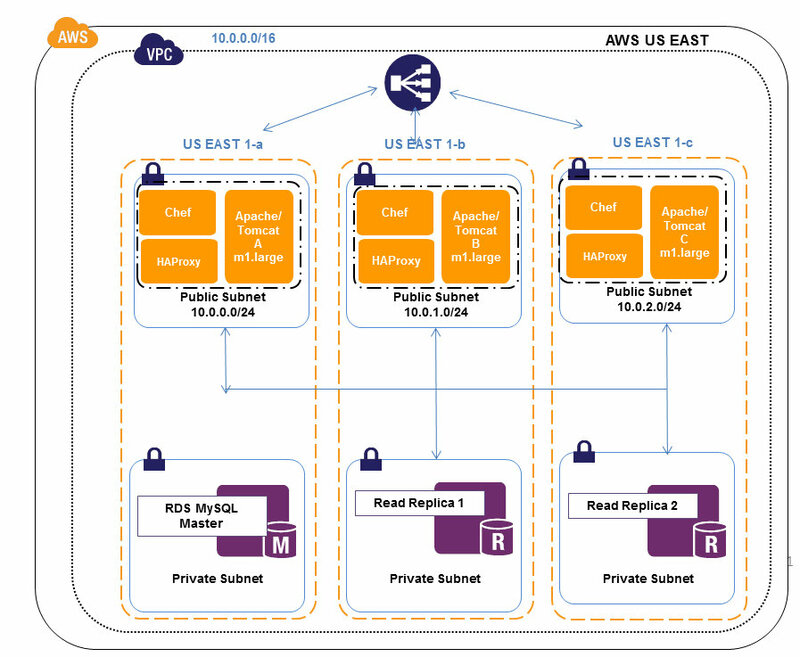 Your Web App is deployed in Amazon Auto Scaling Mode. You have 2 or more RDS Read replica slaves with your RDS Master. This is good, now the question is how do you load balance requests between your Read replica's, What happens when you elastically scale out new RDS Read replica's ? There are multiple architecture techniques that can be followed to solve this problem from embedding Load balancing plugins in PHP, to introducing HAProxy in between etc. In this post, let us explore how HAProxy can be used to solve this problem in Amazon Cloud. Web/App EC2 instances are deployed in the public subnet of Amazon VPC in Auto Scaling mode. RDS MySQL Master and 2 Read replica's are deployed in Multiple Subnet - Multi - AZ mode. Programmatic changes, plugins or some ideal mechanism is engineered in the Web/App to separate the Writes and Reads DB.All writes go to Master and reads goes to RDS Read Replica's. Web/App EC2 instances are pointed to HAProxy EC2 address. HAProxy Load balancer is provisioned in a separate tier to load balance internal requests from the Auto Scaled Web/App EC2 instances to the RDS Read Replica EC2's. Two or more HAProxies are deployed to avoid Single Point of Failure in this tier. 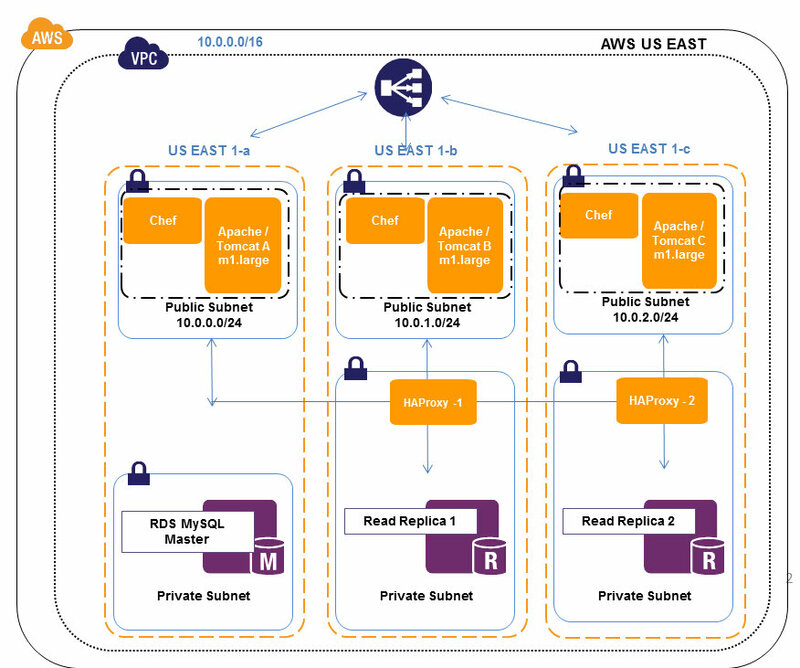 This is a widely used technique in AWS cloud environment for such problems. You can use this RDS MySQL or MySQL on EC2 as well. It is recommended to start with m1.large for HAProxy EC2 instances and scale up instance type depending upon traffic/concurrency. Note: m1.small/medium etc have moderate IO bandwidth and may degrade performance between Read replica's and App Tier. HAProxy is installed/bundled with every Auto Scaled Web/App EC2. Every Web/App EC2 instance is pointed to the local HAProxy itself. HAProxy will load balance requests from that Auto Scaled Web/App EC2 instances to any of the RDS Read Replica EC2's. This is not widely used as the previous one by many users, probably because not many would have thought/implemented on these lines. But i found this simple and manageable in larger AWS production deployments. No single point of failure, if your web/app EC2 instance fails your HAProxy also fails. HAProxy rarely fails individually and is very stable. No additional HAProxy EC2 instances are needed - hence lower cost and ease of manageability. No Scale up of HAProxy required. HAProxy is very light weight and super stable process. It can easily scale the requests with your applications need in the embedded model. No complex logic has to be built in web/App tier. they simply contact the HAproxy and it does the rest. Versions,Instance type and configurations used below are strictly for illustrative purposes only. Note: For production use some modifications might be needed. Create two Read Replicas from the RDS MySQL Master DB instance. To create MySQL Read replica navigate to the dashboard of Amazon RDS, select the Amazon RDS MySQL Master and use the option of “Create Read Replica”. On successful creation, you will get endpoint for each of the Read Replica slaves. The below screenshots illustrates the same. In the configuration file there are many sections like global, default, listen. In each section you may need to specify some parameters and values. In listen section ,specify port for the RDS MySQL(3306) and user for the mysql-check. "mysql-check" is used to check the health status of the back end read replica nodes. In order for health check to work create an user on RDS MySQL master with no password and use it for the mysql-check user option.This detail will be automatically propogated to read replica's as well. The Load balance algorithm used here is Round Robin. Use the following to create user on master for health check. For Production use in Amazon Web Services the HAProxy configuration file and setup can be propagated using Chef. The Web/App process must be configured to use HAProxy for the MySQL read connections.Once the setup is running, In the admin page of HAProxy you can see the distribution of sessions equally in round robin fashion. In the second architecture, do I still have to manage the 'write only to master' in my application logic ?